The oni-versions (Rasetsu/evil spirit) of Animate-exclusive Hakuouki Shinsengumi Kitan Plushies are now available for order! 薄桜鬼 ぬいぐるみ 羅刹Ver. 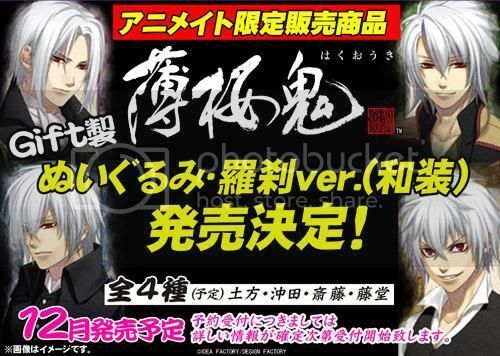 (和装) 土方, 沖田, 斉藤, 藤堂 All sold out expect for Todou Heisuke for now. Anyway, the normal plushies must be selling quite well for them to come up with this new set.